Tag Archive | "Kent County Health Department"
There will soon be another option for area residents looking for affordable dental care. The Kent County Board of Commissioners recently approved the expansion of a partnership with My Community Dental Centers (MCDC) that will include the addition of a new center in the strip mall at 14111 White Creek, just north of 17 Mile Road. MCDC opened a state of the art dental center at the Kent County Health Department’s South Clinic in September of 2014. More than 8,500 patients have made nearly 27,000 visits since. Many of them are residents of northern Kent County who were forced to travel to find affordable oral health care. The new six chair dental center is slated for opening in early summer. MCDC is already accepting patients for the Cedar Springs center. People can call 877-313-6232 and get pre-registered for scheduling. If you ate strawberries at Macaroni Grill October 21-26, the window to get the vaccination has closed. If you ate them Thursday, October 27, then Thursday, November 10 is the last day you can receive the vaccination; and if you ate them on Friday, October 28, then Friday, November 11 is the last day you can receive the vaccination. If you ate strawberries at HCR on October 24, the window to get the vaccination is closed. They did not serve them the other dates. In case you have been traveling within Michigan, there is a complete list of restaurants statewide that may have served the recalled frozen strawberries in recent weeks at www.michigan.gov/documents/mdard/Hep_A_List_of_Known_and_Possible_Locations_11042016_1310_540528_7.pdf. Two people in Kent County have tested positive for the West Nile Virus. According to the Kent County Health Department, the two people who have tested positive are unrelated adults who are residents of Kent County. It is unknown where they contracted the disease. West Nile Virus (WNV) is spread to people primarily through the bites of an infected Culex species mosquito. While this species is known to transmit WNV it is not known to transmit Zika virus. WNV is not contagious from person to person. Its symptoms range from a slight headache and low grade fever to, in rare cases, swelling of the brain tissue. But it can result in death. For three months, ending on Labor Day, the Kent County Health Department conducted weekly surveillance of Culex mosquitoes, testing for the presence of WNV. Tens of thousands of mosquitoes were collected from various areas of the county. Testing was performed on the liquefied remains of up to 50 mosquitoes at a time, and West Nile Virus was found in 20 of those samples. West Nile Virus was first detected in the United States in 1999. Since the first case was diagnosed in Michigan in 2001, more than 1,100 people have been diagnosed with the disease and 92 people have died. In 2001 and again in 2012, Kent County had the second highest number of West Nile cases in the state. The best treatment for WNV is prevention. The Kent County Health Department recommends wearing a mosquito repellant that contains 10–35 percent DEET, wearing light colored clothing and staying indoors during dusk. You can help stop mosquitoes from breeding by removing any standing water in your yard and keeping your lawn and shrubs cut. More about West Nile Virus can be found at www.cdc.gov/westnile/index.html. The Rockford Rams forfeited the first football game of the season last week after several dozen people associated with the team, including players, became ill. The Kent County Health Department (KCHD) is investigating a likely outbreak of Cryptosporidiosis among approximately 30 people who are closely associated with the Rockford High School varsity football program. On Wednesday, August 24, 2016 health department staff was made aware that these individuals were suffering symptoms of a gastrointestinal illness. On August 26, the KCHD received laboratory results that confirm the diagnosis of cryptosporidiosis in a second person associated with the team. Laboratory tests confirmed the diagnosis of a previous case on Wednesday, August 24, 2016. On Thursday, August 25, 2016, KCHD conducted an onsite assessment at Rockford High School as part of its investigation. In light of that assessment and the fact that the outbreak is not significantly affecting other groups on campus, KCHD does not believe at this time that the school or its water supply are the source of the infection. The Kent County Health Department continues to work closely with the Rockford School District to monitor, investigate and mitigate the situation. The investigation is focusing on exposures and activities that are unique to the varsity football team. Cryptosporidiosis is a diarrheal disease that is caused by the microscopic parasite Cryptosporidium. Commonly referred to as Crypto, the parasite lives in the gut of humans and animals and is shed through feces. While the parasite can be spread in many ways, water is the most common method. This can happen when animal waste contaminates a water source and that water is eventually consumed as drinking water or is used as recreational water for swimming. Cryptosporidium is a leading cause of waterborne disease in the United States. More information on Crypto can be found here https://www.cdc.gov/parasites/crypto/general.html. Cryptosporidiosis generally begins 2-10 days after becoming infected with the parasite. The most common symptom is watery diarrhea but can include stomach cramps, dehydration, nausea, vomiting, fever and weight loss. KCHD recommends rigorous personal hygiene and sanitation in the home environment. Good handwashing is important and sick people should not be preparing food for others. KCHD also encourages sick individuals (vomiting and/or diarrhea) to contact their family physician and inform them that they are ill and associated with the Rockford football team. KCHD has notified local physicians of the situation and testing recommendations. The Kent County Health Department (KCHD) Environmental Health division found the first positive specimens of West Nile virus this summer in the mosquito population. The infected mosquitoes were discovered in zip code 49506, which includes parts of southeast Grand Rapids and East Grand Rapids. This is not a human case; no human cases have been reported to KCHD. This year in June, KCHD started capturing and testing mosquitoes in ten traps strategically placed throughout the County. These devices called “Gravid traps” collect mosquitoes that are then tested for the virus. The surveillance is possible thanks to a grant from the Michigan Department of Health and Human Services. Kent County has received the State grant three years in a row. This surveillance allows the County to alert residents to step up prevention measures. The City of Grand Rapids said that it is beginning aggressive treatment to reduce the possibility of a widespread West Nile outbreak. Monday the City began treating identified areas with larvicide pellets into catch basins and areas of pooled still water. Prevention is critical in the fight against West Nile, an illness that can be deadly in some people, especially those with weakened immune systems and the elderly. KCHD recommends wearing a mosquito repellant that contains 10-35 percent DEET, wearing light colored clothing and staying indoors during dusk. You can help stop mosquitoes from breeding by removing any standing water in your yard and keeping lawns and shrubs cut. Following these tips can be helpful in fighting other mosquito-borne illnesses as well. This image depicts a child with a mumps infection. Note the characteristic swollen neck region due to an enlargement of the boy’s salivary glands. 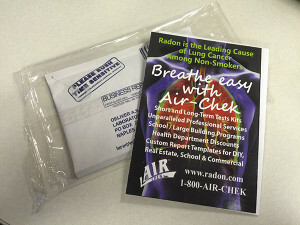 Photo from the Public Health Image Library at CDC.gov. GRAND RAPIDS – Last Friday, May 13, the Kent County Health Department (KCHD) received the test results from a sample obtained from a student at Calvin College. The results, provided by the Michigan Department of Health and Human Services, confirmed mumps infection. The Kent County Health Department is aware of approximately 16 students on the campus who have not been vaccinated for the mumps virus and strongly recommends that those individuals now receive proper immunization. Calvin College will be offering vaccinations for those students. gathering. These measures are consistent with guidelines established by the Centers for Disease Control and Prevention (CDC). 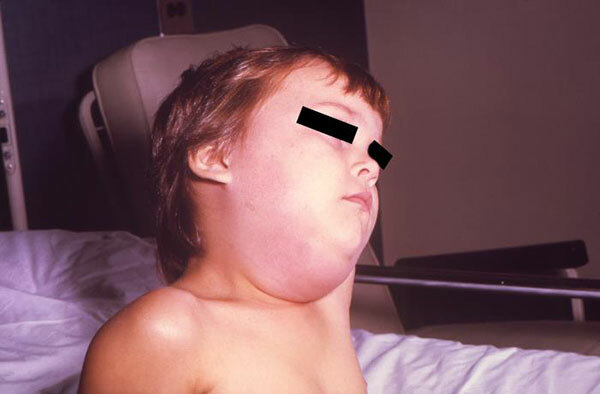 Mumps is a highly contagious vaccine preventable disease that is caused by a virus. It is spread through saliva and can be transmitted by coughing, sneezing, sharing drinks or utensils, or even talking with an infected person. Mumps is best known for the puffy cheeks it causes. Other symptoms include fever, headache, muscle ache, tiredness, and loss of appetite. People with these symptoms are advised to contact a physician. For more information on the mumps go to: www.cdc.gov/mumps/about/index.html.